Are you feeling like another month is just racing past, because I know that I am! I am popping in today to share my take on this month's inspiration board/sketch challenge and to show how versatile a back to school collection can be! 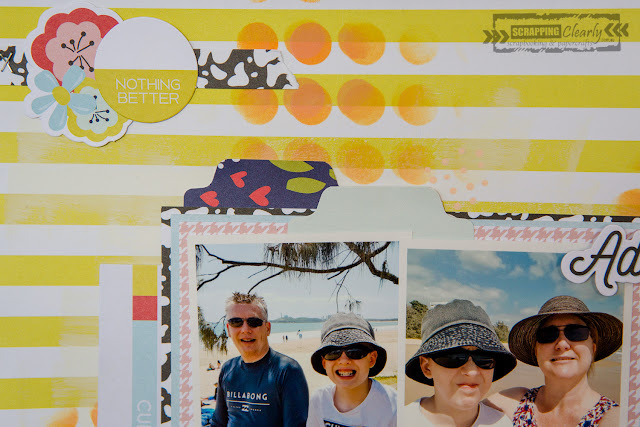 There is a lot to be inspired by with this inspiration board! I chose the theme of being outdoors and being together as well as loosely using the colour scheme. 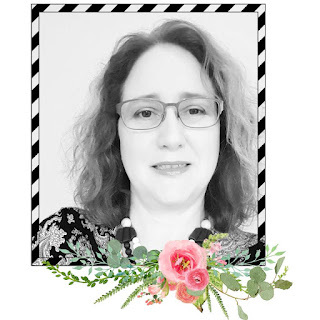 With the sketch, I really loved the starburst background but adapted it by using horizontal stripes instead, and I created a variation on the circle bokeh effect too. 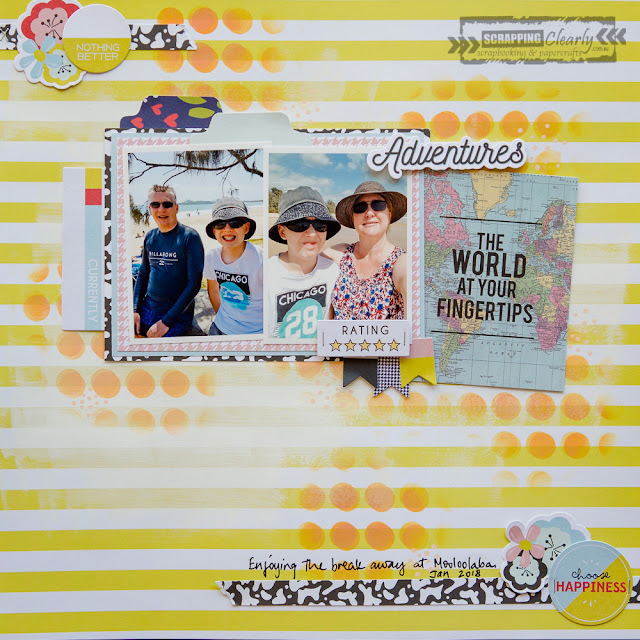 I created my page using the fabulous Fancy Pants Take Note collection, which technically is a back to school themed collection, but includes some wonderful elements that can be used for travel themes and just general pages. I followed the sketch pretty closely for the placements of my photos and embellishments but added my usual layers and matting behind the photos. I chose a bright yellow striped paper for my background and added some white gesso to the area behind my photo stack to help soften this, and adding lots of layers and matting to my photo stack also helps to separate them from the busier background. Rather than using another photo for the sketch, I chose to use one of the cards that came in the collection, I trimmed it a little so its scale fitted better with the sketch. To create a variation on the bokeh seen on the background I decided to do a shadow style effect with distress oxide inks and a circle stencil. 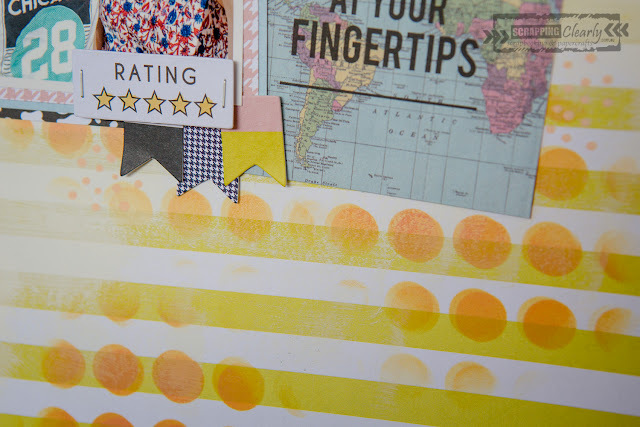 I used a 6x6 version of this Crafter's Workshop stencil for the smaller circles, but you could use any stencil variation that you wanted to create the same effect. To create this effect I chose two similar colours one slightly darker than the other, Spiced Marmalade and Wild Honey. I just love the Distress Oxide inks, and especially the chalky effect they give. I placed my stencil down in the areas that I wanted the circles and started with the lighter colour. Once finished with that colour I let it dry a little, then placed the stencil down over the same space and offset it slightly to create a shadowy effect, then used the darker ink over the top. A very easy technique to do and so much fun! To add some variation to the circle background I also grabbed my peachy coloured Paint Oven Pen from Jane Davenport to draw some extra little dots, this colour was a pretty good addition for the colour scheme. These paint pens are awesome for doodling over gesso and other paint too! 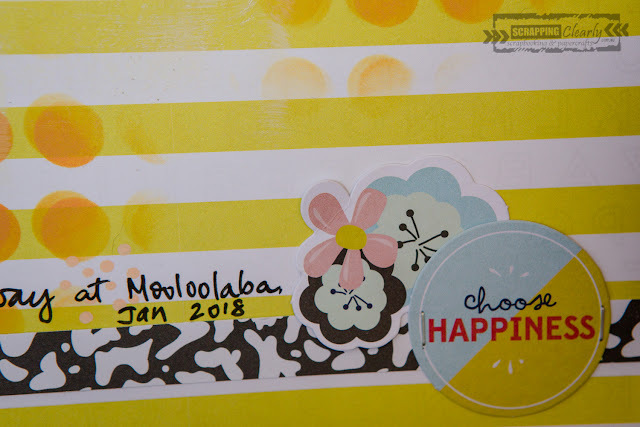 I embellished my page using die-cuts from the Fancy Pants Take Note collection pack, and also used my Tim Holtz Tiny Attacher (a must have in my opinion!) to create a cross on the paper strip, a little hard to see on the patterned paper, but it is there! You can see here I also used the tiny attacher to secure my circle die cut.